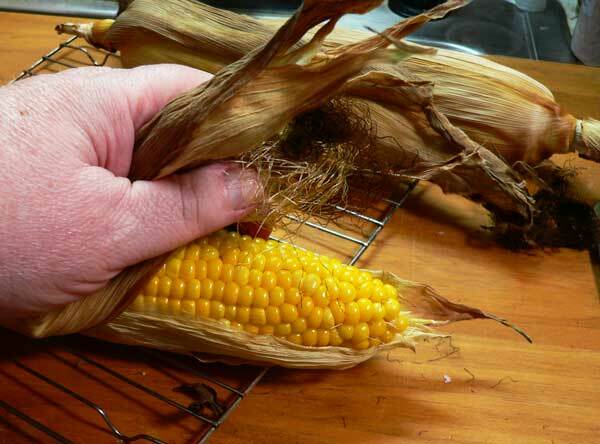 Easy, step-by-step, photo illustrated recipe for making Roast Corn In The Oven, and in the husk. Printable recipe included. About as easy as it gets when you’re ready for roasted corn. Much better than boiling. You might wonder why I would try to make a step-by-step recipe of something so fairly easy to make. But, if you’re reading this, I guess you’re interested in seeing how it’s done, so I hope we can help. Roast Corn in the oven is so simple and easy. And, leaving it in the husk while you bake it just adds to the fun and presentation. It also makes it easier to remove those pesky silks than you might think. When my late wife and I use to attend our North Carolina State Fair, her go to spot was this one particular place that sold nothing but roasted corn on the cob. We always had to stand in line for it, but it was part of the fun. 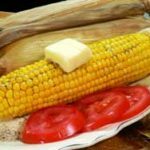 They roasted corn on an open grill, and it was fun to watch them take the corn off, shuck down the husk and silk, then dip the whole ear of corn into a big bucket of melted butter. They’d wrap some paper towels around the husk still remaining on the corn and the towels would be soaked with butter when they handed it to you. It was some kind of delicious though. We might have gone back there more than once on our trips to the fair. It was always a favorite. Roasting corn in the oven is much better than boiling it in water in my opinion. I do it both ways, but it just seems to have more flavor when roasted in the oven. So, if you’re ready for some great corn on the cob, then let’s head on out to the kitchen, and… Let’s Get Cooking! 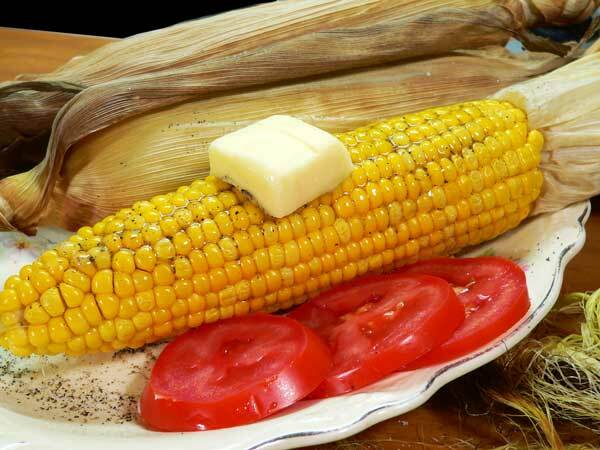 Roast Corn in the Oven in the husk – You’ll need some corn of course. That’s it. Place the corn directly on the middle rack of your oven. Bake for 30 minutes. Okay, we’re roasting instead of baking, but you get the idea. Just leave the corn in the oven for 30 minutes. Carefully remove the corn from the oven. I like to set mine on a wire rack for a bit so it can cool. It’s hot, so use tongs or an oven mitt to avoid burns. After the corn has cooled enough to where you can handle it safely, grasp the husks and silks at the top end of the ear of corn. Pull the husks and the silks back at the same time. It should all come away pretty easily. Remove any silks that you didn’t get the first time. Serve the corn warm. I like to just pull back the husks, clean the silks, then serve the corn with the husks still attached. It’s a good way to help hold the ear of corn in your hand. Add salt and black pepper to taste, then smother the ear of corn in butter. It’s just that easy. It’s so easy to have great tasting corn right out of the oven. Much more flavorful than boiling, just bake and eat. 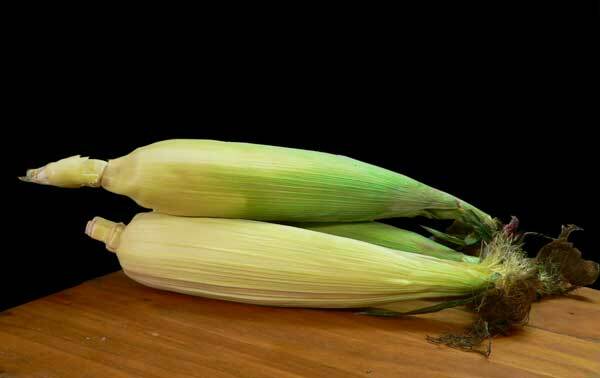 3 – 4 Ears of Corn, or however many you need. Butter to taste, if desired. No need to remove the husks or silks first. 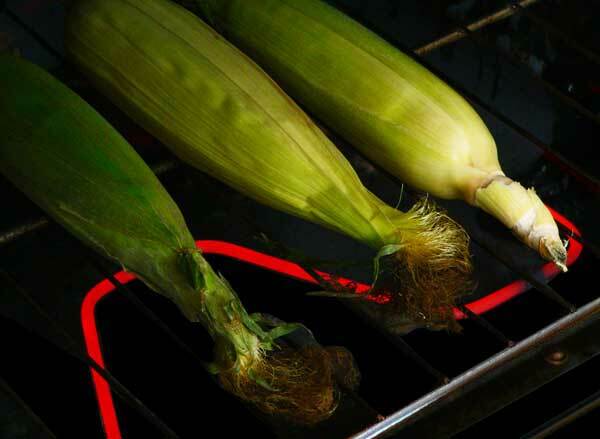 Place the ears of corn on the middle rack of your oven. Roast/Bake the corn for 30 minutes. Remove from oven and place on wire rack to cool enough to handle. Grasp the husks and silks at the top end of the ear of corn and pull back to remove. Remove any silks that didn’t come off the first time. Smother in butter to taste if desired. 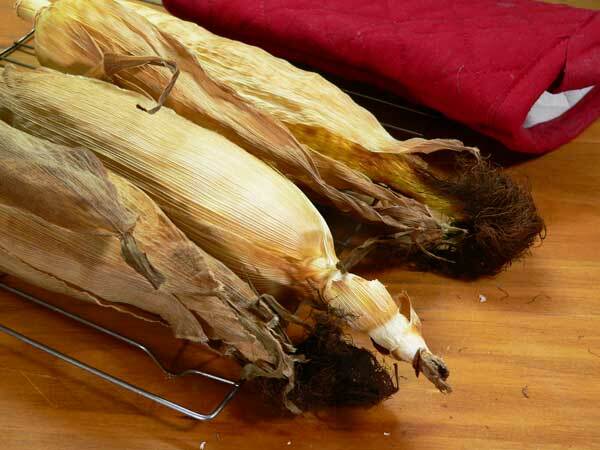 Have you ever tried roasting corn in the husk and in the oven? What did you think of the recipe? I microwave mine. Trim tops & stem then run under water so that a little will seep thru the husk layers. Then place on plate & microwave on high for 5 minutes. Remove from microwave after a few minutes & let cool a bit before husking. I like mine with Tapatio salsa, mayo & grated cotijo cheese. Delicious, fast & easy, plus doesn’t heat up the kitchen. This is how I will try to cook corn in the future. My husband is the one who overcooks it in a pot of water. Thank you for posting! The first time I had roasted corn was at camp where the corn was buried. It was fantastic! Ever since then, if I am at a BBQ they have put me in charge of corn on the bbq! However, never in my 50 years I never thought to put it in the oven… how silly of me! . It was delicious! I paired it with a recipe I got off of Natasha’s kitchen, shrimp cakes. It was perfect! Boiled corn is just blah compared to roasting! Thanks again for teaching this old dog a new trick! Wish we could get fresh corn here! It is usually pretty road weary by the time we see it! Oh how I love how you share such beautiful endearing stories with each of your recipes. As a child my parents made sure we went to the Michigan State Fair in Detroit every year, never missed a year. I continued the tradition with my own family until the powers that be ended the fair and then moved it to Novi. When in Detroit, along with the elephant ear, we made several trips to the corn stands to get fresh roasted corn dripping in all that butter. After you have fresh corn you don’t want the frozen or canned stuff. The Novi location has yet to bring the fresh corn back but it doesn’t stop me from going to our Eastern Market to get some fresh corn. I usually boil or fry my fresh corn but this recipe is a winner winner chicken dinner too. Corn cooked this way takes me back to my childhood, when my parents would do a version of this in the coals in the grill. Very good, I need to cook this for my family, (in the oven). They have never had it cooked this way. I cannot wait to plant my corn next Spring.This sounds so easy and I know if you recommend it therefor it must be delicious. Bless her heart but my wife boils our corn for an half hour and leaves it in the water until the rest of dinner is served. I have tried to lead her down the path to not over cook it, enough said. I still love her! Thanks again for the great country cooking recipes!